Posted July 31, 2013 by piet & filed under Brasil, News. 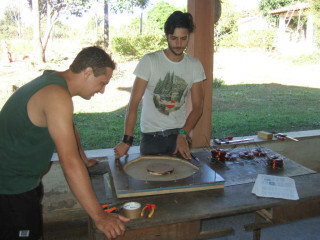 Hereby a story about the proceedings of the workshop written by Marco Ogno, the teacher. When I arrived at Montes Claros. 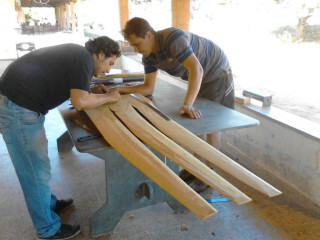 Luiz Carlos and I had just three days to prepare the whole workshop. These days literally flew away, running around all day long, looking for the material for the workshop. Getting it done in time got even more challenging because during the daylight was short (8am-5pm). Soon we realized that things are not going as planned: the material is more difficult to find than expected and also more expensive than was initially budgeted (prices here in Brazil are arising rapidly and we could also not allow too much time to look for the best price). 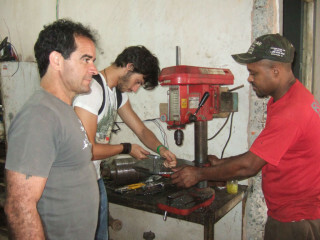 We had a bit of a rough start: most of the tools were still in Rio de Janeiro and were two days delayed. Hence we had to start the workshop without all the necessary tools. Therefore I decided to buy the first essential material and tools in order to start the workshop: mainly ‘Madera’ (wood) and some metal parts. Especially the blades consume allot of labor that can keep the group busy. Furthermore two people that were key for translation support canceled their participation. Therefore the English technical manual, my written explanations and the presentation slides could not be translated. 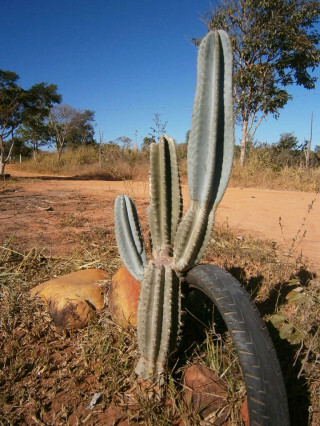 Then we went toward the so long dreamed Fazenda Mandacaru of Luiz Carlos! The location is amazing: it is a huge terrain located in the remote village of Pau de Óleo (Oil Wood) – 40 minutes away from Montes Claros. 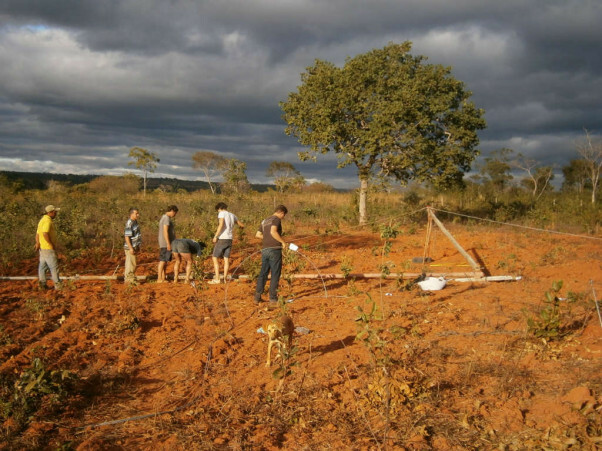 The fazenda is immersed in the middle of the nature. Here the animals are not afraid to come close to have a look at our workshop and finally at our turbine! 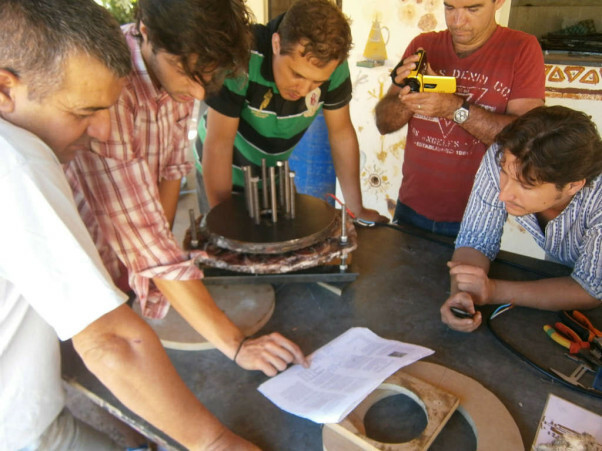 Friday afternoon – the day before we start – we had already five participants showing up and show to be ready to get their hands on the turbine: Diego, Farley, Vando, Fabio and José. The alarm in the morning is ringing at 7am and at 8 the coffee is served together with a presentation of the daily schedule of the work. It seemed the group could not use the English manual and I could not really express myself without Luiz Carlos standing next to me. Work in parallel between metal, wood and electronics is very difficult because I am the only one who knows what to do, and I am not able (yet) of being in different places at the same time. 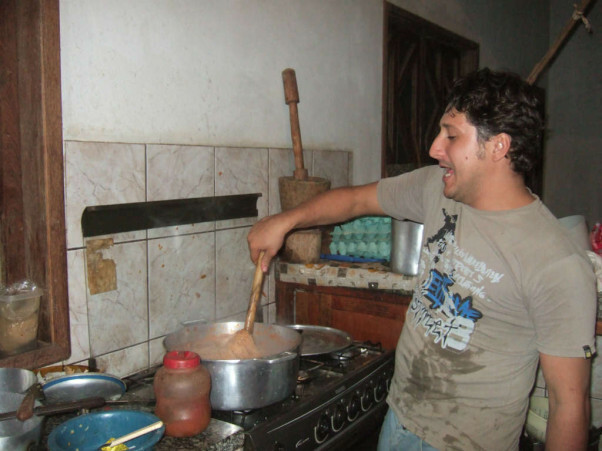 Moreover, the Brazilian style of working is really difficult to manage: they like to take breaks and talk, they try to do their best and are dare to do things even if they are not sure if they can do it (.. this sometimes leads to difficult to repair mistakes). Additionally everyone of the group tended to follow me where ever I went since I am the front of all the information. Basically everything is going worse than planned, and even if I try to be positive, I understand that the whole project will be harder than expected. I decided to make some changes on the plan, since the original plan seems to be not realistic. I realized that the slides as well as the technical manual not really helpful due to the limitation of my Portuguese and the impossibility of a simultaneous translation. Therefore I decided to move the presentations from the mornings to the evenings realizing that when the sun goes down and we cannot work anyways. Thereby we directly start to work around 8am making most out of the daylight. I adapted quite quickly at their way of working, but I also stress the fact that we have a sort of schedule to follow. Tomás arrived Saturday evening with the tools. With a memorable effort he drove 12 hours to bring us the tools as promised and after a long sleep he left for another 12 hours drive back to Rio to make it on time for his exam. Now we had the tools, we could speed up. In general the group reacted well, they do their best and we get closer with the time passing. During the evenings the nice meals, the MAGIC Capoeira songs of ‘Marreta’ (Luiz Carlos) together with the ‘Cachaca Miniera’ and the long games of Snooker, make the after work time really enjoyable and offers space to get to know each other better. At the end of the weekend we are one day behind of schedule, but now we know better on which field we are playing this game. 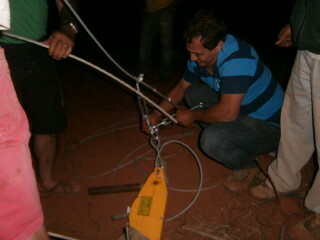 We went back to the city Montes Claros on Monday with a lot of energies to make the next week working perfectly. During the second week, ‘Marreta’ and I we basically repeat the same frenetic shopping behavior, from 8 to 8 around with the motorbike, sneak around the city in order to get the best deals in town. We buy the remaining things: all the metal parts, the plywood, the chemicals for the casting, all the ‘ferramenta’ (stainless) screws, nuts, threads, etc. I prepare the power point presentations with some words in Portuguese and, thanks to the help of Piet from Holland, we double check everything and I solve most of my doubts which are passing trough my head. My idea was that we could make it on time, and well ! However when we returned to the farm on Friday afternoon, everybody already left as we planned to start in the morning. Another setback is that the ‘metal plates and the holes of the car hub’ are not correct: Vando did his best but his machineries were not powerful and precise enough. It’s Friday night; we have the wrong holes and no participants (apart for Diego which has been always loyally with us each time we arrive at the farm). 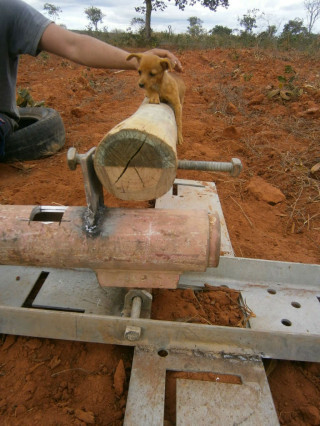 We decided to go back in town the next day to get the right holes on the metal plates and car hub. We are able to come back only in the afternoon. Now the group is reduced to only three people: José and Fabio couldn’t come. It Is Saturday afternoon and we try to fit the ‘Parafusos’ (threads) on the new holes when we realize that the new holes are still not good. This is the worst moment of the whole workshop and of maximum discomfort. The group is de-motivated, the project is slipping away: we run behind schedule and the available budget is getting shorter and in my head I start to think that it may be that this turbine it will never spin. 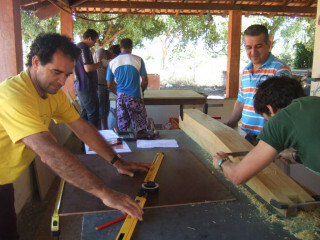 However here the Brazilian spirit made the difference and actually drove the project forward. The people, even if a reduced group respect the beginning, started to show commitment, they voluntarily started to work during the evenings under artificial lights and never stop to be positive and enthusiastic about the project. In the end the problem is just the rotor, we can focus on what we still can do without the metal plates. Therefore we finish with carving the correct thicknesses along the blades and we build the coil winder after receiving the new calculations of Piet (in order to adapt the system for the “new” magnet size). 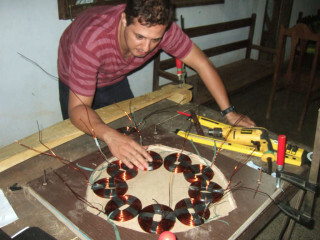 On Sunday we are able to wind the coils and prepare the mould. Before that the sun goes down we cast the stator. Unfortunately the polyester mix solified in less than 6 minutes (instead of an hour), exactly at half way while pouring the mix in the moulds, the polyester was already hard. 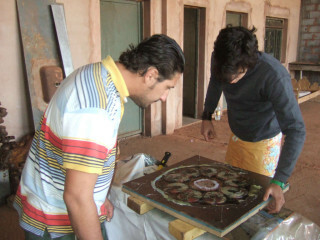 A part for having lost something like 2L of mix, we decide to go on and make a new mix and finish the casting. It was already dark when we closed the mould really tight. 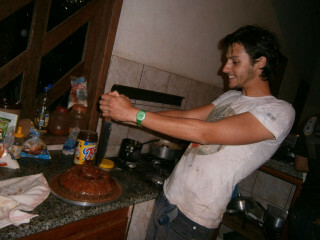 The rest of the group left the fazenda for the coming working week, while Diego, Luiz Carlos and I stayed at the farm. On Monday morning we unpack the stator, while doing so we accidently hit a coil wire. The islands in the rotor and stator show cracks on the polyester. 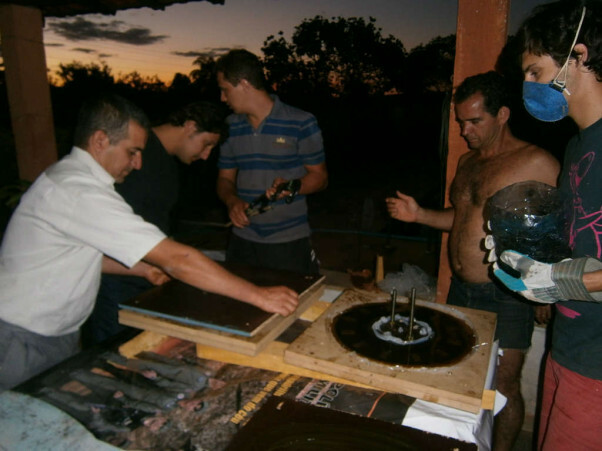 Without knowing if we could repair the damage we leave the fazenda and we go again to Montes Claros to again try to fix the holes in the metal plates. While we were at the ‘Torneria’ (mechanic specialized in working with metal mechanical parts) I realize my big mistake in thinking that the holes of the metal plate should have threads while they do not need them. We solve it by making larger holes (15mm) and we finally could fit the threads in the car hub and in the metal plates at the same time! Finally! Good news came also from the side of Piet, which ensure us that we could repair the polyester and damaged wire. The rest of the week, even if with many doubts if try to continue or not the project due to the numerous difficulties and the increasing expenses, we go to re-buy the polyester mix and the remaining parts to try to erect the tower. 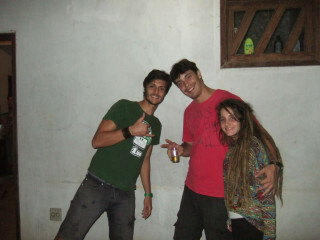 At the same time Fanni (my girlfriend) arrives in Montes Claros and I sincerely am really happy to see her. However we are really behind schedule and the time is starting to press on our shoulders, so we decide to go at the fazenda earlier, on Thursday night. On Friday the usual group, Diego, Farley, Vando, Marreta and I together with Fanni, work without stopping and everything finally goes as supposed! We could repair the stator, make the holes, weld the main frame, finish the carving of the blades, place the magnets on the rotor disk and cast them. On Saturday we could finally mount the alternator and test the voltage output: unfortunately even with the most close configuration possible the 60Hz test gives values in between a 24V and 48V system, unable to reach the initial goal for a 48V turbine. However we go on with cutting the base of the blades, mount them on the alternator and finally see the turbine rotating even if on the ground. On Sunday we start to work on the tail and to the tower. 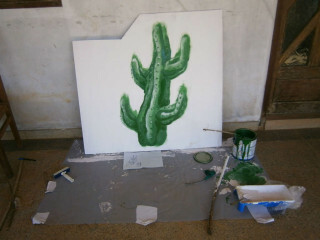 Fanni, the artist of the group, spent the morning on painting the sign of the fazenda , a ‘Mandacaru’ (cactus), while we have hard time on welding the 15m tower. At half way of the tower to welding machine leaves us for better life and at the same time we are running out of cutting disks. It is Sunday, no shops open and there is nothing else to do than simulate all the erection steps and make a list of things necessary in order to finish the tower and erect it on the next week. 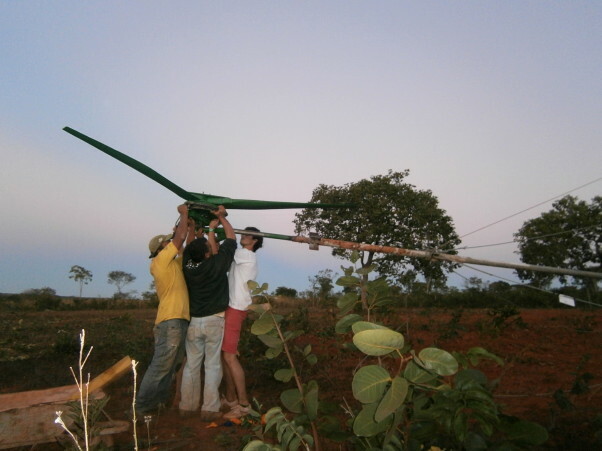 On the other hand we have a funny Sunday afternoon, the project looks like taking the right way and despite all the troubles that we had, we can finally look at our turbine spinning even if it is at ground level, drinking a beer all together and watching the magic Brazilian sunset. The hard work and pushing forward starts to pay off! We enter on the 4th week of the workshop, and we decide to meet on Wednesday since it is a national holiday and everybody can join the workshop. We arranged another welding machine, and we have just enough material to make a try for the erection of the tower. However things, once again, don’t go as planned: the welding goes really slow and just when we start to doubt if we would have enough time the second welding machine also breaks down. We go on making the length calculations for the metal guy wires (to keep the tower up). These calculations are difficult because the terrain is on a complex slope and each anchor point is situation on a different height level. At the end of the day we managed to get all parts of the tower welded. We also managed to get the hinge system for the 6m ‘Pagliaccio’ (boom of wood) placed in the right position, attaching all the different wires to it. However we reached the end of the day and there is no time to test and erect the tower. We have to move the final day to Friday. On Friday we had some delay and we arrive at the fazenda only at the afternoon. Ready and boosted to finish in a while, we can’t get in the house because we forgot the keys in Montes Claros. Going back is not an option since there will be then not enough left to finalize, so we start the ‘Operação Jiboia’: Luiz shows his Capoeira abilities by entering in his house from the small bathroom window (60x40cm). We get the tools from the house and we go straight to the tower. It is almost dark when after completing two erection tests without turbine. We finally try the erection with the turbine up in the sky. At 6pm of Friday 5th July the 3m turbine is erected at 14.4m hub height. We can leave the crop field happy in the dark and celebrate the success together with the 52nd anniversary of Luiz Carlos! My evaluation of the WS is extremely positive. The group experienced a whole range of troubles and problems but they overtake all of them with enthusiasm and spirit. Even if they couldn’t get proper explanations of all the technical details due to the difficulties of understanding English from me and from the manual, they believed in me and in what I was telling them to do, and in the end we succeeded. I must admit that I had at times serious doubts on the final realization of the project, and without the help of the group, their motivation and they way of smiling at everything and being able to laugh even when everything goes wrong, we could never finish this project successfully. 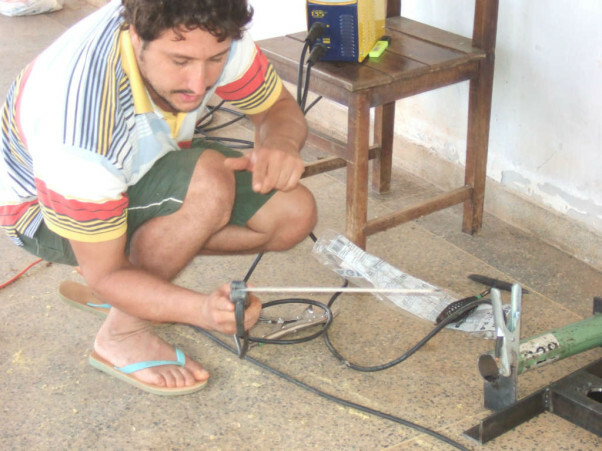 During this month here I learned a lot…I actually, for the first time, understood how the turbine works and how it is made, I get to know the real Brazilian life and the real Brazilian people, their way of living, thinking and doing things. I understood their supernatural way of feeling the nature and their unbelievable way of expressing humanity, socializing with everyone, and loving to just ‘talk’ with everyone about everything, just for the pleasure of spending time together with other people. 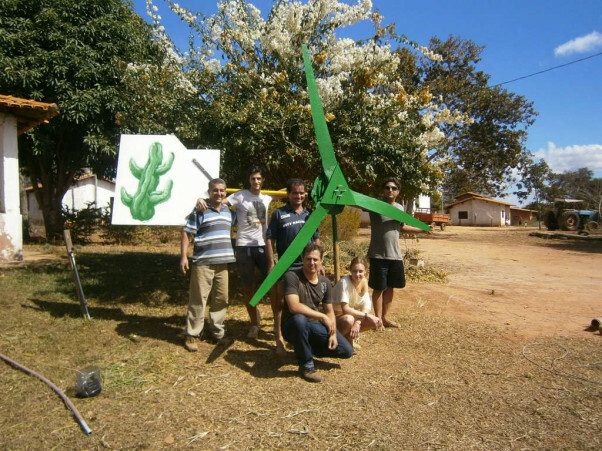 We didn’t make only a turbine but we also build a nice small group of people, enthusiastic of wind energy and interested on going on and learning more. Besides that, I have at least made 5 special new friends living on the other side of the planet. Thank you to everyone for their special efforts that was needed to make this happen.